Thank you Liesbeth Boel’s article to publish this article about our Rhino Awareness and Protection Program in Belgiums “Het Nieuwsblad”. Read the article (in dutch) here. Another Exposure in Dutch magazine Quest. 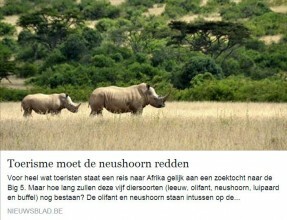 New Exposure in Dutch Newspaper for Rhino Watch Safaris!